Check this dude’s tat out… first time I have seen the whole thing. I had only seen the sleeves on his legs until now. This is taken during a competition last Sunday. 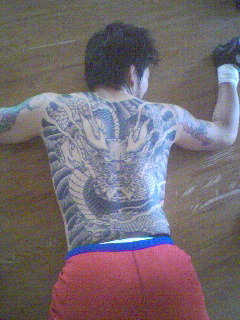 He won the Kumamoto Free Fight. Dude looks like a full blown gangster… but I am almost 100% sure he is nothing of the kind. Just a far out tattoo.